I've got quite a few trips planned over the next few months, so I picked up this Manduka eKO Superlite Travel Mat. I was enticed by the light weight and seemingly endless ways to pack it, and ok, by its vibrant red color. I used it for the first time in Mallorca, and was pleasantly surprised. Weight: only 2 pounds makes this mat easy to throw in your duffle bag and not think twice. Color: I can't speak to the other colors, but the red is really vibrant and the color didn't transfer to my clothing or feet. Thickness: This is a really thin mat. Super, super thin. This is a plus if you don't need extra cushion for your joints (knock on wood my arthritic issues seem to be at bay). Stickiness: This is personal preference, but I love that this is very sticky. You will not slip and slide on this mat. See the third picture that shows the sheen of the stickiness. Eco-friendly: This mat is made from non-Amazon harvested natural tree rubber. No PVC, toxic plasticizers or harmful dyes. Packability: You can fold, roll or do a combination of both to fit this bad boy in your purse or carry-on bag. I love that! Smell: Because it's made from rubber this mat smells like rubber. This was also the case with the Manduka eKO Lite Yoga Mat I reviewed, but the smell eventually went away a couple weeks later, so I'm sure this will, too. Pricepoint: This mat costs just under $40.00, which is a lot for a mat when you consider you can get one at around $12.99 at Target...but those mats have PVC and this is eco-friendly, so you have to decide what's important to you and if it's worth it. This is definitely a keeper. I love that I can just pick it up, fold it up and go without any hassle. Can't wait to take it on my next adventure! 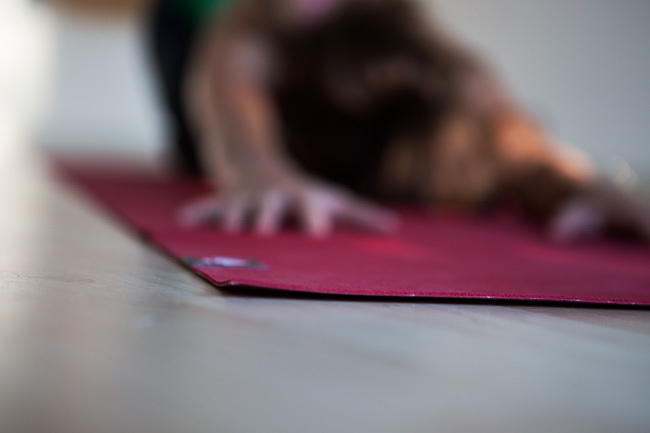 PS- The holy grail of yoga mats, how to create a yoga sequence, and is yoga enough?